Visit Roullet: 46-48 Rue d'Isly ,16100 Cognac ,+33 (0)545361600 ,No visiting information available. Tasting review by Roullet Cognac: Amber color with bright copper shades. Aromas of sandal wood, spices, dried fruit, nuts, licorice, bitter orange, mango, and chocolate. The taste is rich, round with tenacious notes of candied fruits. It was down to one Paul Frederic Roullet who, after surviving the massacre of the French Revolution, eventually managed to gain a licence from the Republic in 1791 that allowed him to distil wine. He then went on to become a liquor supplier to the armies of Napoleon Bonaparte. He actually founded the house of Roullet in 1780. Since then the house has remained in the family, each generation handing their knowledge and prowess onto the next. Mathias Paul Roullet is the ninth generation of cellar masters who've been tasked with leading the house. Today Roullet Cognac remains a family run concern, but is actually part of the larger company, SAS LES VIGNOBLES REUNIS-ROULLET. The family own and farm over 200 hectares of vines, the majority of which are in the Fins Bois region. They also own vines in Grande Champagne and Petite Champagne. Roullet produces a wide range of Cognacs, many of which are unblended. For those looking for such Cognacs, then this is certainly a house with which you want to become acquainted. Their Cognacs really do represent great value for money. 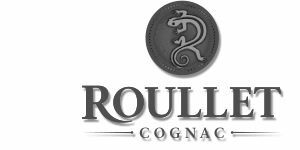 Roullet produce Cognacs for every occasion and every taste, from the entry level Roullet Amber Gold ***VS Cognac right through to an exclusive range known as 'Roullet Tres Rare Cognacs'. These old and rare delights are easily identified thanks to sporting a number at the end of the name. A somewhat unique aspect of this small, artisan house is the fact that all of their Cognacs are aged for at least twice the legal amount of time to qualify for the particular age status. The Cognacs of Roullet are beginning to cause a bit of a stir in the world of fine liquor. In 2017 the Roullet VSOP Grande Champagne Cognac was awarded a gold medal by the Beverage Testing Institute (Chicago). The Cognac was the leader in its category, and also was announced the 'Best Buy', and 2017 Best VSOP Cognac. The American magazine, Wine Enthusiast, also stated this Cognac to be the Best Buy in 2017. There is no information available about visiting Roullet et Fils Cognac. We suggest you contact the house directly if you wish to visit. I have a bottle at home of Roullet Cognac Amber Gold No. 02931. I would like to know what it is worth. Thank you!